Backup battery keeps time in the event of power outages,Power Requirements: 110-220V, 5VDC. Supplied Accessories: AC power adapter, dock adapters, and documentation. With the Sony ICFC05iPBLK Clock Radio you can charge your iPod’s battery while you sleep. This Sony ICFC05iPBLK Clock Radio is the space-saving bedside accessory for iPod® and iPhone® users. Set the alarm to wake to the radio, iPod®, or a buzzer. The charging tray ensures both you and your iPod/iPhone® start the day with a fully charged battery. Plus, The Sony ICFC05iPBLK Clock Radio features a built-in digital FM tuner lets you choose from a wide variety of radio, talk and music programming. Order the Sony ICFC05iPBLK Clock Radio today! 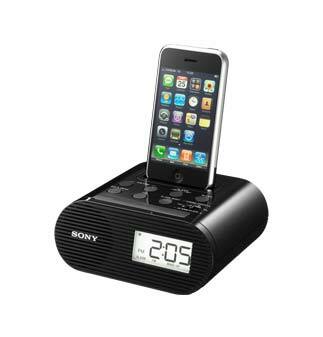 This convenient, bedside iPod dock/clock radio from Sony is just what you need to wake up to songs on your iPod or iPhone. The space-saving design is perfect for your nightstand, and you can choose between the radio, iPod, or buzzer to start your day. An adjustable brightness level ensures you won't be distracted while trying to fall asleep. Wake to your iPod, radio, or buzzer. A space-saving, nightstand-friendly iPod dock alarm clock. Your iPod or iPhone will charge while docked to help you avoid a drained battery, whether you're listening or not. When you wake up ready to go, your device will be, too. A built-in digital FM tuner lets you catch up on the news, check the weather, or take in your favorite morning show while you get ready for your day. Pull up your favorites in an instant, with 20 presets. Wake up to your iPod, iPhone, the radio, or an old-school buzzer. If you can't bear to get up just yet, the alarm features a programmable snooze from 10 to 60 minutes. The sleep timer lets you drift off to your favorite tunes on iPod or the radio, adjustable to 15, 30, 60, or 90 minutes. To keep accurate time, a CR2032 battery provides a backup power source. You'll still be on time in the event of a power outage. Sony ICF-C05iP, AC power adapter, dock adapters, and documentation.